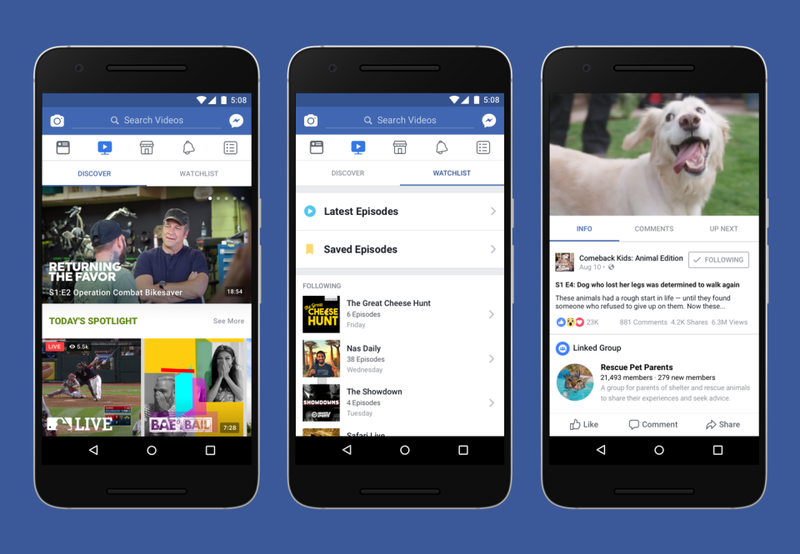 Facebook has been hard at work to re-position the consumption of media contents on the platform, thus prioritizing it with easing content creations, and now the company have a new home for the original programming, available on mobile, desktop, and Facebook's TV app. The new "Watch" tab for original video content is a continuation of the company's push to make video consumption mainstream on the social network. It's an exclusive platform for videos created by Facebook users; as such Watch is a dedicated place where anyone can go to watch videos, instead of waiting in News Feed to discover new videos. With personalized preferences, users will be able to get shows tailored to their taste, both live and recorded, and also based on what friends are watching. The watchlist include such categories as "Most Talked About," "What's Making People Laugh" and "What Friends Are Watching." Facebook took a leave from its "Live" offerings, where users' comments and reactions to a video often serve as part of the experience as the video itself, and so with the friends comments you can connect with other viewers while watching, or participate in a dedicated Group for the show. The feature is now live to a limited group of people in the U.S., with plans to bring the experience to more people around the world. With also a limited group of creators for Shows in the U.S. and plan to roll out to all soon.